Electric guitar kits give you the essential parts of a guitar unassembled so you can build the guitar yourself. While some kits are for people with advanced skills, most kits of this sort are designed for the novice builder. So even if your experience with working with you hands is minimal, you can still have success with a guitar-building kit. The following electric guitar kits are known to produce great sounding guitars for a price lower than if you bought the same kind of guitar fully assembled and new. Solo Music Gear has a three-tone sunburst Strat-style guitar kit called the Model ST (or STK). It has a basswood body and a rosewood fingerboard. All the most challenging wood shaping and cutting and fret-leveling is already done. A beginner to intermediate level builder could complete this kit using their step-by-step instructions and basic tools. This kit builder's review highlighted a few minor flaws that were in the kits pre-assembled design, but the flaws did not affect playability. (And they were flaws that only an advanced builder would notice.) The reviewer had high praises for the pickups, the neck routing, and the finish. This kit cost about $130, which is not bad for a Strat-style guitar that was reviewed as being better than a Squier Strat or even an authentic American Fender Strat. BYO's custom Telecaster-style guitar kit gives you everything you need to build a guitar that mimics the design and sound quality of a Fender Telecaster. While some kits are consistently fantastic and easy to build, some kits, such as this BYO kit, have more complicated pros and cons that need to be sorted out before you buy. Pros: It's all in the name. When it says it's a custom kit, that's exactly what it is. On the BYO site, there are drop-down menus that allow you to choose different options for each component of the guitar from the wood type to the pickups. Cons: According to some reviewers, some of the parts are noticeably low-end cheap, the wiring was not done superbly (which meant he had to do some basic rewiring), and there were missing drill holes (which meant he had to take it to a local luthier to put in correctly sized holes in a few places). The reviewer in this case did qualify his remarks that he had very high standards and wanted the best quality parts. That being said, this guitar kit may require a little more extra work on your part or may need some help from a local luthier to get it perfect. This kit might be better suited for at least an intermediate builder who can correct minor issues. Though in the following video, some of this kit's builders are quite young so it must not be too challenging to complete. This custom Tele kit costs about $360 depending on which custom options you select. Some options add extra charges. Guitar Fetish, which is for luthier enthusiasts and known for its exquisite kits, has an ES 335 kit with a beautiful flamed maple top, semi-hollow body, and a rosewood fingerboard. The kit has received five-star reviews without any negative comments. However, one thing is clear when you explore the Guitar Fetish's description of the kit: it is really meant for advanced builders who are familiar working with chisels to shape wood. You will notice that the builder in the video builder crafted some of his own parts and was comfortable using a chisel. This semi-hollow 335 is a beautiful instrument, but it might be a project to save for when you've mastered more luthier skills. If you buy directly from Guitar Fetish, it costs about $300. Fretwire has a quality Les-Paul style electric guitar kit. Freya Wilcox, the lead singer and guitarist for the band Freya Wilcox & The Howl, was kind enough to do a review and demonstration of this kit as you will see below. Overall, she observes that Fretwire's Les Paul kits, especially the Spalted Maple, have a higher quality than many other kits though she recommends upgrading some of the components (i.e. the pickup). Freya Wilcox is clearly an experienced builder with strong skills, but this kit is within the skill range of an intermediate builder. If you want to do every upgrade she does, however, you will need more advanced skills that go a bit beyond the beginner or intermediate level. She does some advanced woodwork and fret leveling and dressing herself. The cost ranges from about $150 to about $400 depending on your pickup selection. The basic stock pickups will yield the bottom price, but you have the option to upgrade to any one of a long list of high quality Seymour Duncan pickups, which bring the price up. The kit costs about $284 and received an average of four out of five stars out of over 60 reviewers. To save yourself work and time, you can choose to have the electronics pre-soldered and ready to snap together upon arrival. You can choose to have the wood pre-drilled. You can also pick from a few pickup designs and choose either an alloy or a paddle headstock shape. Here are a few things to keep in mind as you build your own electric guitar. Do not begin the build until you've done a complete review of the parts that came with the kit. Pull out the instruction manual and verify that all needed parts were delivered. It is a massive headache to find out halfway through the build that you're missing something. It's important that you use the right kind of glue (i.e. Titebond or something like it) and the right amount of glue if you are setting your neck instead of bolting it on. Don't use so much glue that some of it is clumping up between the neck and cavity. The goal is to have the neck resting flush against the body timber. 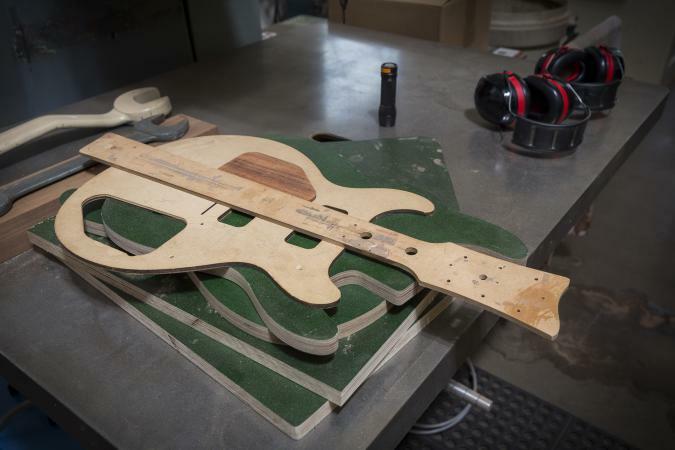 Let the neck set for 24 to 48 hours before proceeding with the build. Make sure you have the right scale length before gluing. For extra help, watch the following video on gluing your guitar's neck to your guitar's body. One of the best things about using a kit is the money you save. You get a great guitar for a fraction of the cost of buying a pre-made instrument in a guitar store. The trade-off for this benefit is your labor. First-timers often underestimate the time involved. Don't approach this project if you are in a tremendous hurry to have a functional guitar. The journey should be as enjoyable as the destination. As with any do-it-yourself project, things can go wrong along the way. In fact, they will go wrong. This happens with everyone, even veteran builders. This is part of the learning process. Make sure you are mentally prepared for missteps that will inevitably occur. Follow the proper steps for setting up intonation on a guitar so that once you've finished the build, you can tune your guitar and feel confident about its sound and ability to stay in tune. Now that you've seen the options available to you, you're ready to make your choice and begin your building project. Your first kit will always be the most difficult, but when you finally plug in the guitar you built yourself, you will experience a tremendous sense of pride that comes with creating something unique.